So some individuals at Autodesk got to see our ‘handcrafted’ videos available at our PKLabs YouTube Channel and got in touch. Ani Deodhar, a Program Manager in their Sustainability Group, explained to me he had a mandate to come up with the best work flows across all of their product lines in order to energy model existing buildings. They have been working on geometry extraction in the labs and anyone who has seen the Photofly demos can attest, this looks very promising. However, our goal with PKNail was always to capture dimensionally correct space and do so with a minimum of software knowledge so PKNail can be leveraged across an organization rather than with a specialized few. I am not knocking any process just pointing out that if you want to move a pallet, for example, it would be nice you could just do it rather than find the guy or gal with the forklift license and then ask them to move it, and then hopefully you get it right the first time. Maybe not the best metaphor but you get it, the more people that can do something, the more of whatever ‘it’ is you can do. 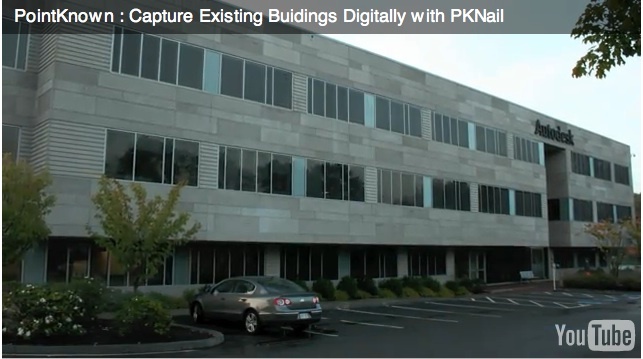 On site at Autodesk Waltham and using PKNail we were able to survey, measure, build in real time the shell of the building in Revit in less than 3 hours. Then depending on what level of detail, and features you want in the deliverable you may want to spend sometime in the office. However, when we left we knew we had all the key dimensions and information and the model itself was built. 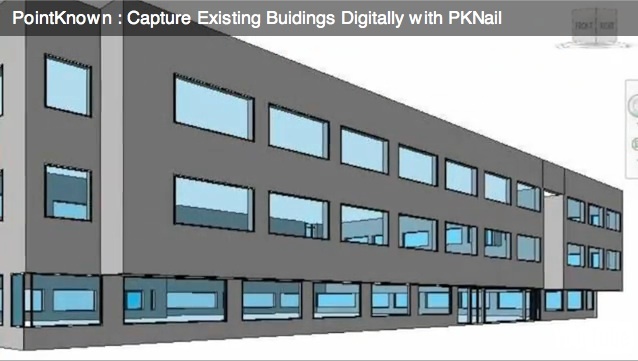 This was done at a level needed for energy modeling and we only modeled from the exterior but PKNail allows you to create interior layouts, floor by floor as needed as well. It was then ported through Revit CEA to create an energy analysis of the building. When creating PKNail we wanted to make things easier on ourselves. The product grew organically from our architectural surveying business. When you’ve repeated the same task enough times, or if you missed a crucial step or measurement that would require you to back to the field, etc. you think there must be a better way. Just like when you make the jump from 2D to 3D you thought, there must be a better way to communicate with my clients, coordinate views, coordinate disciplines, and here it is. Revit is increasingly becoming that better way. Use it however you want, it’s a tool, you can use it communicate visually with your clients if that’s what you need it for or use it to coordinate construction; your choice but it helps. PKNail allows you to quickly and accurately capture existing buildings digitally, either just the exterior for energy modeling or to start your as-built documentation. Well, I don’t know if I would say it exactly like that, but yeah, that’s what we did, and I added that we created a workflow and process that squeezes the surveying knowledge of our organization into the software so people can be a success right out of the box. We wanted to take something simple, point and shoot distance meters, very simple and marry it with something that can be infinitely complex, 3D BIM authoring tools as in Revit, and in turn try to make that simple. Measure a wall/build a wall, window, levels, etc. We call this PPLT (Point to Point Laser Technology). So until we got robots doing this stuff we can never take away the human element from what we do, and so, let’s make just make it easier, faster, better, much like the $6 million dollar man.